Transmission electron microscopy image showing different levels of crystallinity embedded in the amorphous matrix of the alloy. A team of engineers has developed and tested a type of steel with a record-breaking ability to withstand an impact without deforming permanently. The new steel alloy could be used in a wide range of applications, from drill bits, to body armor for soldiers, to meteor-resistant casings for satellites. The material is an amorphous steel alloy, a promising subclass of steel alloys made of arrangements of atoms that deviate from steel’s classical crystal-like structure, where iron atoms occupy specific locations. Researchers are increasingly looking to amorphous steel as a source of new materials that are affordable to manufacture, incredibly hard, but at the same time, not brittle. 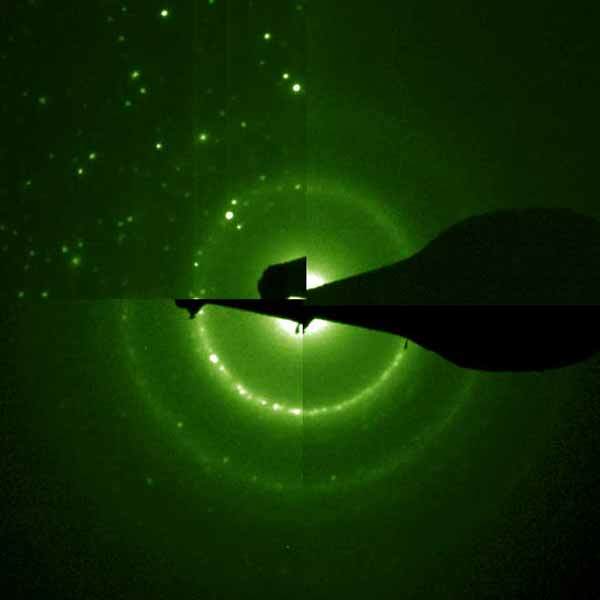 The researchers believe their work on the steel alloy, named SAM2X5-630, is the first to investigate how amorphous steels respond to shock. SAM2X5-630 has the highest recorded elastic limit for any steel alloy, according to the researchers—essentially the highest threshold at which the material can withstand an impact without deforming permanently. The alloy can withstand pressure and stress of up to 12.5 giga-Pascals or about 125,000 atmospheres without undergoing permanent deformations. The researchers, from the University of California, San Diego, the University of Southern California and the California Institute of Technology, describe the material’s fabrication and testing in a recent issue of Nature Scientific Reports. “Because these materials are designed to withstand extreme conditions, you can process them under extreme conditions successfully,” said Olivia Graeve, a professor of mechanical engineering at the Jacobs School of Engineering at UC San Diego, who led the design and fabrication effort. Veronica Eliasson, an assistant professor at USC, led the testing efforts. To make the solid materials that comprise the alloy, Graeve and her team mixed metal powders in a graphite mold. The powders were then pressurized at 100 mega-Pascals, or 1000 atmospheres, and exposed to a powerful current of 10,000 Ampers at 1165°F (630°C) during a process called spark plasma sintering. The spark plasma sintering technique allows for enormous time and energy savings, Graeve said. “You can produce materials that normally take hours in an industrial setting in just a few minutes,” she said. The process created small crystalline regions that are only a few nanometers in size, with hints of structure, which researchers believe are key to the material’s ability to withstand stress. This finding is promising because it shows that the properties of these types of metallic glasses can be fine-tuned to overcome shortcomings such as brittleness, which have prevented them from becoming commercially applicable on a large scale, Eliasson said. Researchers at USC tested how the alloy responds to shock without undergoing permanent deformations by hitting samples of the material with copper plates fired from a gas gun at 500 to 1300 meters per second. The material did deform on impact, but not permanently. The Hugoniot Elastic Limit (the maximum shock a material can take without irreversibly deforming) of a 1.5-1.8 mm-thick piece of SAM2X5-630 was measured at 11.76 ± 1.26 giga-Pascals. By comparison, stainless steel has an elastic limit of 0.2 giga-Pascals, while that of tungsten carbide (a high-strength ceramic used in military armor) is 4.5 giga-Pascals. This isn’t to say that SAM2X5-630 has the highest elastic limit of any material known; diamonds top out at a whopping 60 giga-Pascals— they’re just not practical for many real-world applications. “The fact that the new materials performed so well under shock loading was very encouraging and should lead to plenty of future research opportunities,” said Eliasson. The primary focus of future research efforts on these alloys is increasing the weight of the materials to make them more resistant to impacts. In addition to Graeve and Eliasson, co-authors include: Gauri R. Khanolkar and Andrea M. Hodge at USC, Michael B. Rauls at Caltech and James Kelly from the Department of Mechanical and Aerospace Engineering at UC San Diego. This research was supported by the Defense Threat Reduction Agency, grant HDTRA1-11-1-0067.